A restaurant manager is one of the key stakeholders of a restaurant. The main job responsibilities of the restaurant manager are to manage the staff of the restaurant, managing the tasks of food preparation, food serving, handling supplies and cash register and a lot more. There are endless opportunities for a competent restaurant manager. 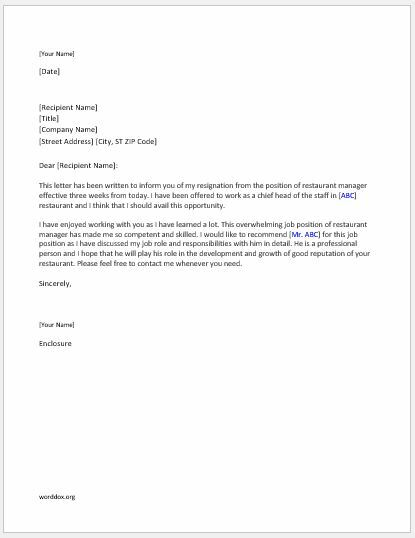 If he wants to leave the job for any reason, writing a restaurant manager resignation letter is a professional way to leave. Every professional individual goes through the process of writing the resignation letter in his professional life. There can be different situations in which a person must resign from the job. Sometimes, there are some uncertain conditions in which the person has to leave the job. No matter how much the situation is uncertain, writing the resignation letter is always certain and should be written effectively to make the reader understand your situation. Writing a resignation letter can be a complicated task. However, you can write it very easily if you have planned to stay truthful. Here is a sample resignation letter that you can use in order to resign from the position of the restaurant manager. This letter has been written to inform you of my resignation from the position of restaurant manager effective three weeks from today. I have been offered to work as a chief head of the staff in [ABC] restaurant and I think that I should avail this opportunity. I have enjoyed working with you as I have learned a lot. This overwhelming job position of restaurant manager has made me so competent and skilled. I would like to recommend [Mr. ABC] for this job position as I have discussed my job role and responsibilities with him in detail. He is a professional person and I hope that he will play his role in the development and growth of good reputation of your restaurant. Please feel free to contact me whenever you need.